Our HH2400-3-50CSLC is a great match for large jet aircraft, $9995.00 complete with our HH2400 wireless transceiver. Wireless cell fitted with our dongles transmit 100's of feet with a very strong signal, accurate and easy to use. Kits come with full factory NIST calibration certification and are ready to use. Our HH2400-3-50CSLC is our large format cell kit with wireless control using our HH2400 Hand Held transceiver. 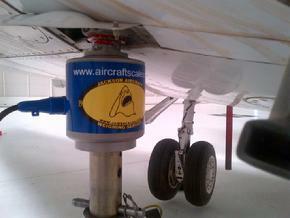 User friendly and easy to use, no cables, no extension cords, just turn it on, wake the cells and weigh your aircraft. Our large format cells are a perfect for the Hawkers, Gulfstreams, EMB's and RJ's, large cups for the large jack points gives you full control and deep retention of your jack point inside the cup. Hawker series scales are avalible, our M2000-3-50CSLC scale system is a large format cell kit that works great on the large jack points of the series. M2000-3-50CSLC is $8995.00 three 50,000lb large format cells, 50ft cables, three channel digital indication, 110 US and 220 Euro power capable. 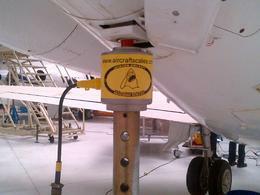 Hawker 800XP main jack point detail. 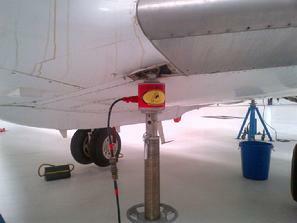 Here you see a Hawker 800 main jack point with our large format cell in place. Our equipment mounts on the standard one inch hole found on many jacks like this Tron Air unit shown. Dont have a Tron Air? Not a problem, we also manufacture jack adapters for other jacks like the Myers jacks. Adapters fit over the ramp top and provide mounting for our cells. Our large format cell kits are a great tool for medium to large corporate jets as well as regional jets for airlines. Here you can see the difference our cell tops make in depth of the cup and retention of the jack point. Our M2000-3-50CSLC kit can also be used on a variety of other jets and is a must have for MRO and Repair Stations servicing large jack point aircraft. Close up of main jack point and clearance. If you need a scale system just give us a call, we can advise on the type and size that best fits your aircraft type and or service needs. We have several scale sizes available from small to very large weight ranges, including platform systems up to 15,000 lbs per platform. Call Larry Jackson @ 561-281-6179 or just email: larryjackson@jawsscales.com for a quick quote, recommendation or to answer your questions. We would like to thank Jet Aviation, Dubai, UAE. for the great pictures above. Aircraftscales.com supports Jet Aviation world wide as well as other major MRO and Repair Station operations around the globe.